I call myself a Saturday artist. Working full time limits when I can paint. I am always thirsty to learn new techniques. As an artist you tend to see beyond the common. When you look at a field of corn you see the shapes of the stalks, how they line up in the field, how the shadows play, the darkness toward the roots and how the light plays off the husks. Where do you create your art? 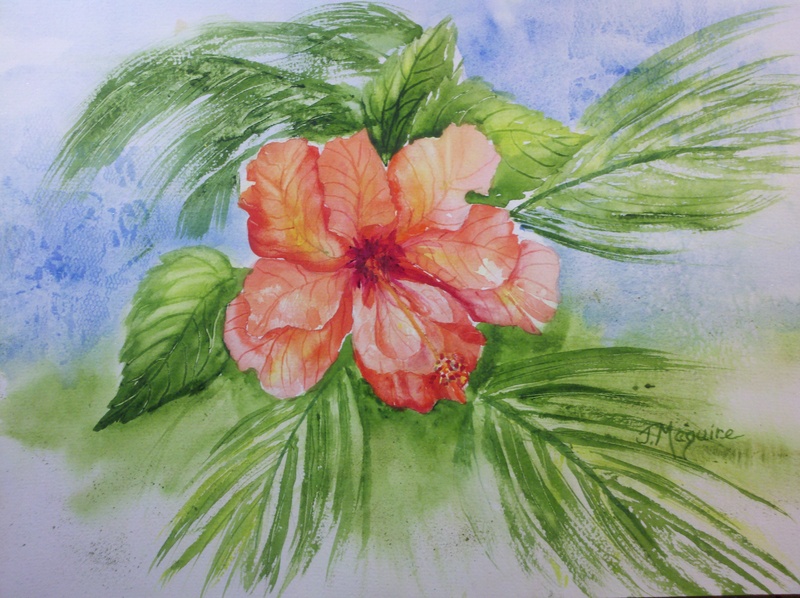 I create most of my art in my mind – color, forms, shapes, feelings – until it just has to come out on to paper. The first major piece I did, and what got me started into serious painting, was a field of poppies named “Field of Dreams”. 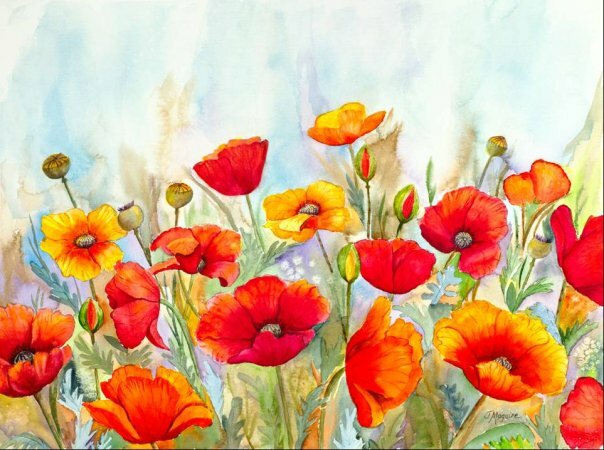 For many years I thought about how I could paint a field of poppies that were not your typical red field. I wanted to capture the feelings, smell, and texture of the petal against the coarseness of the leaves and pods. Then one day, about nine years ago it just “came out”. The first original sold and the second, “Field of Dreams II” is now my signature piece. 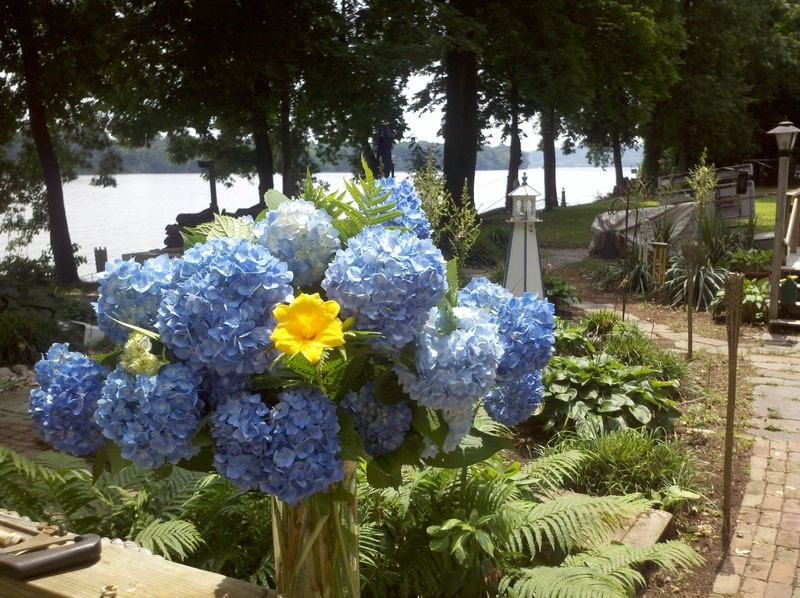 I have a small dream studio on Beech Island, located on Lake Frederic on the Susquehanna, directly across from TMI! Surrounded by water, beautiful Herons, butterflies, flowers and ferns makes it a lovely place to paint. During the winter months I live in Hershey and paint and frame at my home. Whenever I travel I carry my brushes and camera. All my life I did some type of art or craft but I always came back to watercolor. I put all my projects away and try to keep watercolor my priority. I did take an oil painting class and really like that medium. I think I will make that my secondary medium in a few years. I did several abstracts in oil that have sold… which is encouraging! My eraser is my most favorite tool. Seriously, I panic if I don’t have it when I am working on a sketch or painting. 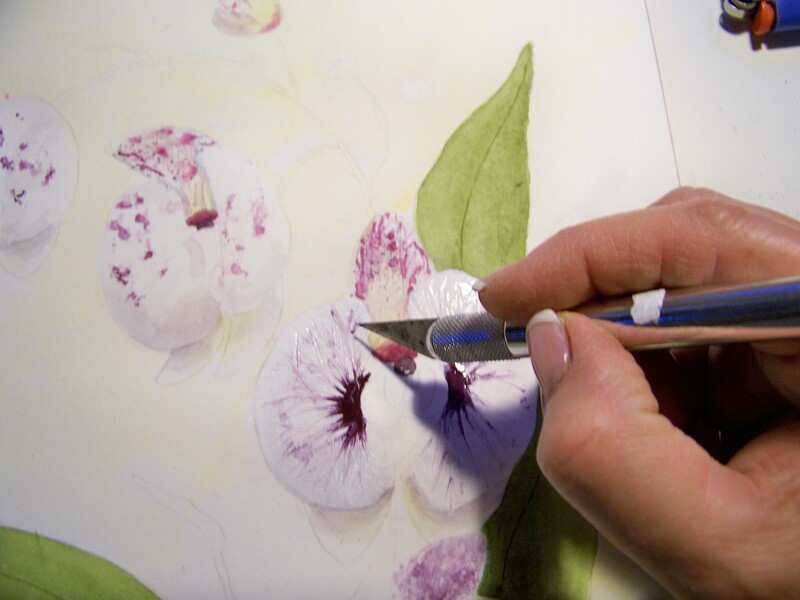 I also use a metal gadget designed by Terry Madden that allows me to create thin veins in petals and leaves or large flat scrapes to form rocky areas while your paint is still wet. High quality paint, paper and brushes are a must. You paint with what you can afford, but it is better to have a small amount of high quality products then a large amount of lesser quality tools. I use Arches 140 lb cold press block for small paintings and Arches 300 lb for larger paintings. The heavier paper allows you to create texture, make corrections and remove color without damaging the surface. It is like when your body craves orange juice, my mind craves to create. Otherwise I might be summoned by an amazing orchid calling my name to take it home and paint it. Can you describe your medium and style? Years ago I started painting very tight and detailed and wanted to let loose and have a freer style. I would watch Terry Madden on WITF every Sunday morning – right before Bob Ross! I took one of his workshops which allowed me to open up and have a looser style. 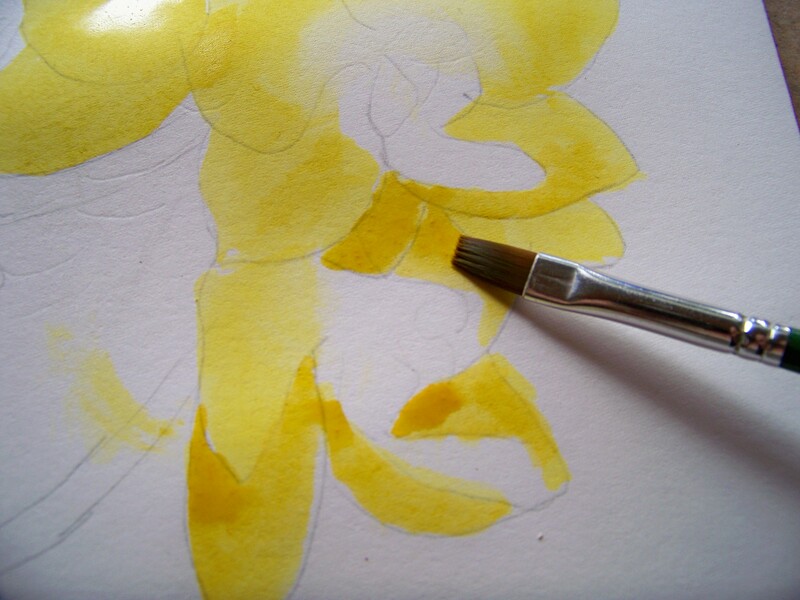 Many people think watercolor is a hard medium to work with but you can use muted, soft tones or heavy intense colors. They can flow freely or be controlled – depending on the amount of water you use and your style. Watercolor is very portable and dries fast. The convenience makes it easy to work with. My style of art brings me joy, a smile, a moment away from myself. 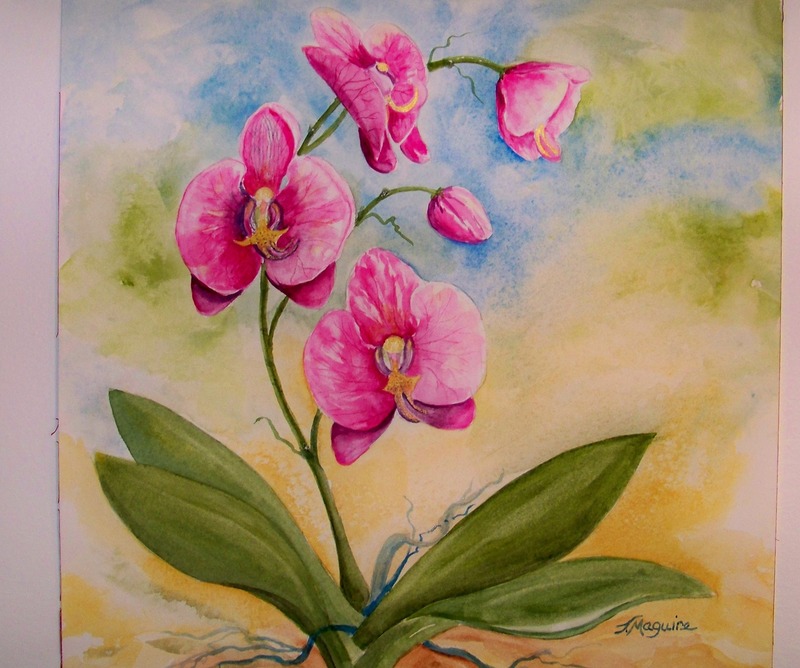 It is my hope that my paintings bring the same happiness to those who own and view my art. Most of my work doesn’t make you think; rather it lets your mind drift to a fun or calm place. I have been playing with Yupo – which is plastic instead of paper. The paint sits on top, swirls and pools. When it dries you can paint on top or wipe off areas you don’t like. It forces me to paint with a fun free spirit despite myself! I do have some nice spaces to paint, but lately I have been thinking about making a 10 X 10-foot space in my basement where the floor, walls and ceiling are covered in a heavy plastic. I would hang paper and canvas all over the space and then just start wildly creating – painting them all at the same time to a good music beat. Do you have a favorite technique that you use a lot in your work? A tooth brush (dedicated to painting I might add) can give you great texture when spritzed for sand, highlighting or adding a little metallic glitz to finish a picture. Salt, both fine table salt and course Kosher are not only good on your food! I often use a little on a painting as it will add interest after it absorbs the color and feathers the spot. When I paint a sky I do a blue wash and then blot out the color, creating wonderful fluffy images. Occasionally I will use a sea sponge to give texture to foliage. Somewhere along the way I thought, or was told, that watercolor was the hardest medium to work with. (I grew up having to drive a stick shift before I was allowed to drive an automatic) So I think that is why I started with watercolor. I don’t have that philosophy anymore but there is so much more I need to learn and try with this medium that I want to keep with it. 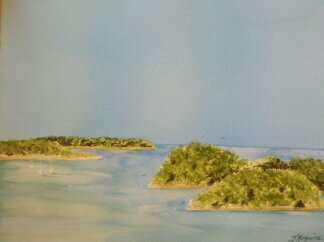 My Aunt Marion (MEL) Fetterolf is a watercolor artist of national acclaim. I probably was influenced over the years with her work and chose the medium because of her. The feeling that you get when you look at it. I want my art to take the viewer away, into the scene or feeling, to have a few minutes of calm from their hectic day. What artists do you relate to? Growing up in Chester County Andrew and Jamie Wyeth were big influences. I took a few classes at the Art Association of Harrisburg by David Lenker who also painted in that style. My father, Eugene Liesau, started oil painting later in his life. He did beautiful still-life oils. Some people have said my work has some similarity Georgia O’Keefe. I love the cleanness, bright color and form that she used. When I decided I was going to be an artist and sell my work I established goals. These started out by joining art organizations, entering competitions and exhibiting in galleries. 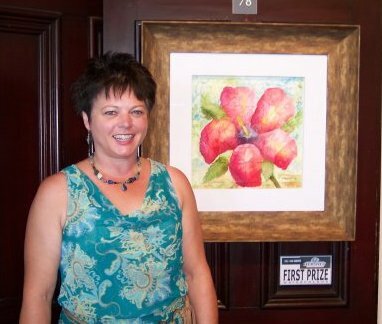 My next phase was to establish an internet presence which culminated with my own web site at www.Joanmaguireart.com Here, buyers of certain prints get a chance to win the original painting after a set number are sold. My five year goal is to expand my gallery presence outside of the local area, grow my internet business and to continue to learn and grow as an artist. I also take picture of all my steps of painting. During one of our Mixed Media meetings it was suggested I use this process to create eBooks. Look for them in the future! Joan’ Maguire’s future ebook in progress. 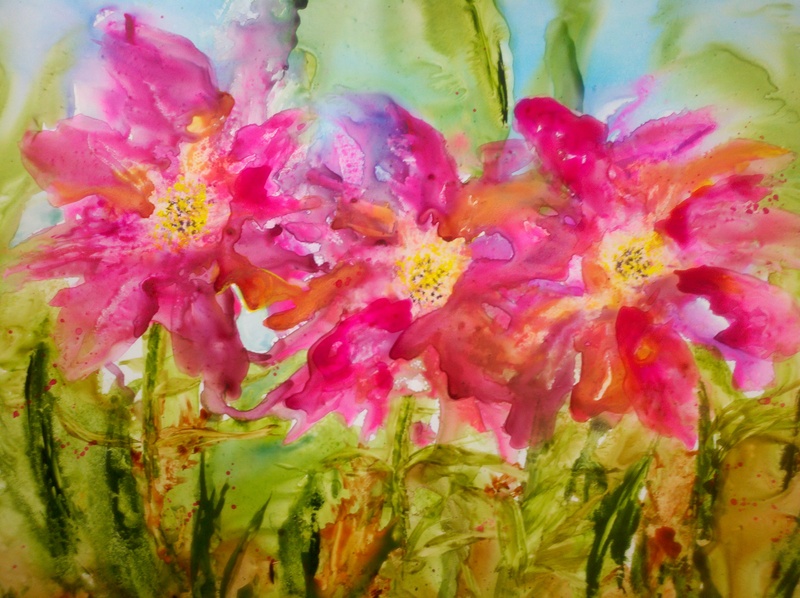 Joan Maguire’s painting process in her ebook. This entry was posted in Joan Maguire, Meet Our Members and tagged abstract, abstract art, acrylic, Art Association of Harrisburg, art exhibits, Art of the State, Beech Island, ebook, floral paintings, Harrisburg PA, oil, painting, Pennsylvania, Pennsylvania artists, Pennsylvania State Museum, poppies, poppy, water color painting, watercolor, yupo on January 27, 2013 by mixedmediaartgroup.